The following is a guest post from my good friend Physician on Fire. I’m not a drinker (since a bit after college) so there’s no way I could write a post like this. But he’s the PERFECT candidate for it — a beer connoisseur who writes in a very witty manner. I like beer. I brew beer. I drink beer. I’ve invested in startup breweries. The swag I hand out at FinCon? 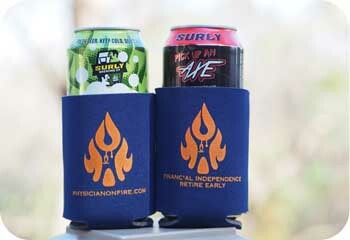 Physician on FIRE logo beer koozies. For better or worse, beer has been there on my best and worst days for the last twenty-some years. Not every day, of course. I abstain at least as often as I partake, and I know it’s not healthy to throw back a six pack, so the plan is generally to have two, maybe three, and I’m pretty good at sticking to the plan. But I am human — a human who enjoys beer. My wife and I like to wind down in the hot tub with a beer after we get the kids to bed. Beer pairs well a football game tailgate, and I’ve got season tickets. At most family and social events I attend, alcohol is the social lubricant of choice. I’m no raging alcoholic, but I’d be lying if I said beer played a non-trivial role in my life to this point. To take a month-long break from beer would not be terribly difficult, but it would be somewhat unusual. Late this summer, knowing we’d be fresh off a lengthy vacation and returning to a busy work schedule for the remainder of the year, my wife suggested we consider having a sober October. Like a dry January, a movement that has gained steam in recent years, but two months earlier and rhyming better. I loved the idea. That is, once I confirmed that the abstinence proposed would apply only to drinking alcohol and not to any other activities we might enjoy together. In September, we spent a week at Disney World with a free dining plan that included an alcoholic beverage with every lunch and dinner. I’m not one to turn down free drinks. We then cruised to Cuba and Key West. We had Mojitos on Monday with our friends from Waffles on Wednesday, another couple of humans who enjoy a good beer. The month ended with FinCon, the conference that doesn’t sleep. I was almost looking forward to this sober October. Sunday, September 30th was a long travel day, and no beer was consumed. I was a saint on All Saints Day, not that I had a choice (I was on call for the hospital). Altogether, our inebriant-free dry spell lasted 33 days. This isn’t the longest I’ve abstained from alcohol. I’ve given it up for Lent a couple times, but it’s probably been about ten years since I’ve done that. I was probably overdue to shake up the habit of having a beer for no reason other than it’s Thursday night and I’m not on call. I slept well. It’s a well-known fact that while alcohol can induce sleep, your sleep quality suffers when under the influence. 33 days of alcohol-free sleep was restorative and I felt well-rested despite waking up for work at 5:15 a.m. many days. There were several days where I didn’t have to work and got up around 5 o’clock anyway, having already gotten seven or more hours of quality sleep and feeling refreshed. I didn’t miss beer much. Note that I didn’t say I didn’t miss it at all. There were a few times where I wanted to crack a cold one, like when I packaged up these goodies to ship to my friend Scott after losing a football bet. In general, though, sobriety was a non-issue. One night, we had friends over and I was needlessly worried it would be awkward when we explained we were in a sober October. Would they check my ankle for a monitor? Sneak shots when we’re not looking to avoid drinking in front of us? Stage a faux family emergency and ditch us for a cooler couple? None of that happened. If they glanced at my ankles, I didn’t notice. It was totally fine, fun and normal, even if an evening with friends and no beer was atypical for us on a Saturday night. I was on call two of the other four weekends, and being a father and a blogger with a demanding job, I had precious little time to imbibe, anyway. The month flew by. Out of curiosity, and to prove to ourselves that we are truly financially independent, I’ve tracked our family’s spending over the last couple of years. Thankfully, I was able to demonstrate that we had achieved not only financial independence, but also financial freedom. I also learned some things I really didn’t know, like how much we spend specifically on different categories, including alcohol. Between homebrewing supplies, liquor store purchases, and bar, brewery, and restaurant beverages, we have consistently spent about $5 a day on alcohol between two adults. Some of that is for hosting parties. We give beer as gifts, particularly beer from a brewery in which we have some ownership. I’ve even splurged on an $11 beer at a football game, but I didn’t feel good about it. Five dollars a day works out to about $150 a month or $1,800 a year. With a high income in a high tax state, it takes about $3,000 in income to cover this particular expense. A full year of abstinence would be the financial equivalent of a $3,000 raise. That’s not insignificant. Normally, I wouldn’t expect skipping a few evening beers here and there to have much of an impact on my waistline, but this sober October presented a unique opportunity. A year and a half ago, I decided I’d like to lose ten pounds. I even said so on my website, thinking that accountability would lead to guaranteed success. I didn’t have a plan, exactly. I mentioned maybe drinking less beer, and at the 18-month mark, I was actually up a couple pounds. Apparently, publicizing that you want something doesn’t make it so. My friend Carl has talked about a mild form of intermittent fasting — not consuming calories for up to about 16 hours at a time — and I thought I might like to give that a try. Such a plan is not very compatible with evening beers. A typical 5% ABV 12-ounce beer has about 150 calories, and a pint of IPA is closer to 300. It’s actually kilocalories, but for some reason, we’ve dropped the “kilo.” I guess no one wants to think about consuming a million calories in one sitting, but it happens not infrequently. 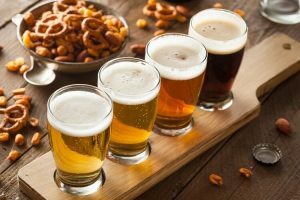 Over the course of a month, two pints of IPA a day adds up to about 18,000 calories, or maybe a week’s worth of recommended calories for an average adult. At any rate, I decided to consume my (kilo) calories only between 11 a.m. and 7 p.m. and to limit my intake to 2,000 calories a day. Or is it 2 million? And, of course, no empty calories from beer or any other alcohol. I lost eight pounds in October. It’s impressive what a month of alcohol abstinence can do for one’s body. “Researchers at the Institute for Liver and Digestive Health at University College London Medical School did a small study last fall of 10 people who considered themselves to be “normal” drinkers and agreed to abstain for 5 weeks. That last point deserves a little more attention. I didn’t go to the monthly meeting of the local homebrewer’s club in October. I’ve got a lot of friends at those meetings. After curling league — men’s league started mid-October — it’s customary to sit down with your opponent for a post-match beverage. I drank water one night and skipped the sit-down another night, citing the fact that it was late and I had to work early the next day. Both were true, but in a non-sober October, I probably would have stuck around for one quick beer and a little more social contact. I’m not saying people ought to drink for the social aspects. There are plenty of people who are social butterflies with or without alcohol, and a life free of alcohol is the healthiest and best option for many. I’m just saying that for me, there are situations in which I’m a bit more gregarious and more likely to have fun with a cool beverage in hand. I’m a little less ISTJ and a little more ESTJ with a beer in my belly. That’s Myers-Briggs personality test speak for a transition from introvert to extrovert, and alcohol is a great catalyst for that transformation. Our sober October is over, and we have had a little beer now in November, but the break from beer was a successful challenge and experiment. It’s easy to settle into familiar habits, and when those habits aren’t necessarily the healthiest, an abrupt change can be a powerful way to mix things up. Having seen the positive impact of a sober October on both my wallet and waistline, I can see us doing this from time to time again in the future. I can also see us taking a different approach to those random Thursdays. With my pending retirement from medicine in 2019, I should have 52 call-free Thursdays a year. Cheers to a happy and healthy future! Great Article, being a home brewer myself I recognize how hard a month could be. I do think that we may try this in January, we tend to travel a good bit and hit breweries around the country. I am not sure I want to see what the annual spend on brewing/beer really is…. I hear you, Jeff. When traveling, it’s fun to find local breweries and sample their wares. October was a good time for us to abstain; I knew we wouldn’t be going anywhere. I drink waaaay less beer than I used to. For me, it just fills me up too much. I’ve shifted to wine a few nights a week, and rarely more than one. Also after reading Why We Sleep I’ve tried not to have the drink too late as they now know more how alcohol interferes with sleep. So far it’s been working out well. Alcohol is definitely not good for sleep even if it does seem to work as a “sleep aid” for some. You might fall asleep more quickly or easily, but the quality of sleep is certainly not as good. I’ve abstained for a month and I lost weight too. Amazing how a 100-200 fewer calories per day makes such a difference. It really is. I was very intentional with my calorie intake. Like I tend to do when problem solving, I changed a whole bunch of variables at once, so it’s hard to say exactly what made the difference, but I’m sure it helped that I didn’t consume any empty calories from the suds. I talk to you every couple of weeks and didn’t realize you were doing that. Bravo! I ended a similar 90 day alcohol (only) abstinence the weekend before FinCon. A nice lasting side effect is it’s now totally recalibrated my consumption downward. I’m now living under zero restrictions, but have still only had maybe 4 or 5 drinks since FinCon. And all of my limited drinking now is the fun-times-with-friends kind instead of the just-sitting-around-the-house-and-maybe-thirsty-…-or-is-that-hungry?-well-let’s-just-have-a-beer-to-find-out kind. Recalibration is a great term. It’s healthy to take away the random beer as the default option. That being said, the next time we get together, I expect to have one with you. Maybe in Costa Rica? I’m not a drinker but I enjoyed the article. I think we all have something that we could abstain from for a month, to exert control over something that is less than ideal in our lives. For me it would probably be over buying food and also removing sweeteners from my diet. Lent has been a good reason to do this with various suboptimal habits. Sometimes we pick up a good habit rather than drop something that’s not-so-good. A fellow curler! Our club only operates about 5 months of the year. I totally miss it in the warmer months. The post-curling sitdowns were probably the trickiest part of my sober October. It’s not like me to not have a beer with the crew. PoF, maybe it’s time for you to schedule a vacation around a summer Bonspiel to fit in some Curling in the summer months! I quit drinking about 12 years ago and found that most of the places I hung out were pretty boring once I sobered up. Oh and the cash flow situation. Lol. Well that increase was like buying a small multi-family. Moderation is the key. But if I had a prized racehorse , I probably wouldn’t feed him cheese fries and give him good scotch whisky. Thanks, Jeff. And props to your 12 years of sobriety. Moderation is the key; I do my best. Used to be a daily drinker myself, had to knock back a few IPAs after work every day to “unwind”. This also meant I was going out more often, at least 3x a week. Throw food into the mix and my average bar tab would end up being around $35. Even for nights at home a 6-pack of premium craft beer is at least $10 (split across two nights). My beer and beer-related expenses easily topped $500/mo. I could max out my annual Roth IRA contribution with that! And don’t get me started on what my bar tabs looked like a decade ago. I cringe at the thought. You think that just because you’re not getting wasted you’re not an alcoholic, but to a degree you are. It’s still an addiction, albeit a mild one. Anyway I got sick of being a slave to alcohol so I quit for a month just to break the habit. I also noticed my waistline getting smaller. Now I pretty much limit it to the weekends and rarely drink during the work week. I also only go out about 2x a month. Having distinct on/off periods makes it pretty easy to notice the difference in sleep quality. I can see the benefits of a 100% alcohol-free life but at the same time I don’t feel I should have to deny myself one of life’s guilty pleasures, something that is generally harmless in light moderation. I hear you, Andy. I’m pretty close to where you’re at. Certainly not alcohol dependent, but I do enjoy it when I partake. I’m proud of you for dialing it back, and it seems you’ve found your sweet spot. I tend to have a beer with dinner most nights, a as in single. Kind of like the wine with dinner stuff except I don’t drink wine. In fact tonite we had dinner at Victory Brewing. Moderation is the key imho. Then again to me beer isn’t a social thing, it’s a way to wind down just a little in the evening. I hear you on the compensation. In the past, if I didn’t have beer in the evening, I would have ice cream or popcorn or some other treat instead. The “nothing after 7pm” rule is the main reason I lost weight. Could have been beer or any other caloric intake, but skipping that evening treat made a big difference last month. I enjoyed this post a lot POF! Much of it hit close to home. Buying beer/wine for home and drinks out at dinner or the bar; the cost adds up. I walk/run nearly 20 miles a week and still have a belly to lose, a month like this might help kick weight loss into gear as well. 2 for 1 benefits. I gave up alcohol two years ago, and my sleep (and my health!) have dramatically improved. I did wonder if people would think I was boring, but it turns out a lot of women my age have given up drinking. I think people who metabolize alcohol slowly (like I do) have a lot of health issues from it. I haven’t lost any weight, sadly, but our grocery bill has gone down slightly. Glad you got a lot out of your sober experiment! Thanks for sharing your experiences PoF. I did a similar thing a couple of years ago. In addition to the wallet and waistline benefits you mentioned, it was interesting (alarming?) how boring/borish many of my “friends” were when I was sober and they weren’t. Made me reflect on who I was choosing to invest my time in, and whether I was actually enjoying having company while drinking more so than the quality of that company. I made some changes, and for the most part haven’t missed their company (nor they mine I suspect). Definitely an unexpected outcome, but in hindsight a welcome and overdue one. Hi POF. I hear you on the beer-loving front. I mean that and not just because I’d be deported and my Canadian citizenship revoked if I said otherwise. I particularly enjoy beer as part of the mix of working or playing outside. Or while chilling out. As I scale back work and do more of that, I have definitely seen my consumption go up. Even though my physical activity is up with more time off work, my weight is also and the caloric density of the suds is definitely a factor. As a compromise, I do throw in the some alcohol-free beer like Heineken Zero (as a light summer beer equivalent) and there are some decent German ones for a more “real-beer” taste. Not a fan of the Bud Prohibition one. They come in bottles so I get some of the psychological feel and my friends don’t glance at my ankles. NA beer is a good trick. Personally, I think I’d rather just have a water. A couple weeks ago, I knew I’d be driving so I had one regular beer and refilled the brown bottle several times with water. I still had a drink in hand but was totally fine to drive after the party. My wife and I have realized that we’re about to have a lot more freedom and we want to avoid having beers routinely just because we can. For the first time ever, there will soon be no nights where beer is off limits. But we won’t be drinking every night. As an avid wine lover, I went sober in late August when I had some symptoms of gallstones that turned out to be just rib pain. It was just before FinCon that I got my test results back showing all was fine. However, I decided that I was on a roll and I’d just keep going. Mostly because of the jet lag (flying from California) and the late nights. It turned out to be great. I had no problem hanging in the pink flamingo with the beer lovers and having just as great a time as everyone else. It felt like a waste to use that free ticket on a sparkling water, but hey, I was thirsty! So, I kept it going and have just returned from the Greece Chautauqua completely sober. This is the first time I’ve traveled to Europe without drinking wine and again, the jet lag was really quick to get over. I’m on my 3rd month and my husband, who makes his own beer, has joined in to take a break. We are heading on a road trip for Thanksgiving to our family of wine makers and it will be a social challenge to keep this going. However, like you, we both have dropped a few pounds and saved a few bucks along the way. We’re not sure how long we’ll keep going, but you have to question this whole category and wonder how much we’ve been influenced by the same marketing ploys that get us to buy McMansions and fancy cars. Good for you guys! I am impressed — a sober October where I was at home or work the whole time was not much of a challenge. Events like a sober FinCon and Chataqua would represent a truer challenge for a guy like me. Cheers (with a sparkling water)! I’ve been enjoy my evening wine probably 5 nights a week for quite some time. Have been concerned about both the health risks of that consumption and the major amount of weight I’ve gained while going through menopause. I”m probably 45-50 pounds heavier than I should be, in spite of my farm activity and a relatively healthy diet. I recently developed a nasty cellulitis infection on my face (probably cross contamination from infected horse hooves I’ve been handling) and was put on an antibiotic, so no alcohol for me. And I needed to really ramp up my water intake because this antibiotic is known for causing nausea. I chug a bottle of water for every dose and stay well hydrated all day. Now coincidentally we also have cooler weather, which always helps me sleep better, but since this change I cannot believe how much better my sleep quality is! I also noticed after a few days off the wine that my joint aches are far less bothersome. Today, 5 days into this, I am down about 0.6 pounds, which is a step in the right direction. So I’m sold on being alcohol-free more than imbibing. We oftentimes just drift into unhealthy habits without thinking much about them, and that nightly wine habit is one of them. I haven’t tried that intermittent fasting but after I’m off the antibiotics I might also give that a go. Exactly. Personally, I don’t think there’s anything wrong if it’s one glass of wine, but I tend to treat beers like Lay’s potato chips. You can’t have just one. So limiting the frequency of drinking is going to be important if I want to keep the weight off. In November, I’ve been more lax and have been simply maintaining my weight. Great post. I used to drink quite frequently. Wine was my go to drink on Friday, Saturday and Sunday nights. Occasionally I would drink beer as well – when I eat out in the evenings with colleagues, customers, whenever just bored, whatever excuse I had. I used to think that I am not a drinker and I have it in moderation. Realistically if we all take a good inventory of how much we consume, we would be surprised – at least I was. I see the grocery alcohol aisles getting bigger and bigger now a days and I wonder about drinking culture. Sorry, not preaching but my feelings. I quit drinking last October and it has been just over a year. Occasionally I miss it but now for the most part I am happy that I quit. I agree with your analysis that one has to make double in order to spend the amount for the alcohol. Most importantly the impact on health is huge. Over a period of time the money that we would spend on our health – especially with cost of healthcare increasing would be hard to calculate. Also difficult to calculate the impact on quality of life. Think about passing the drinking genes as well as habits to our kids and grand kids who are watching us drink and making it feel normal. Thank you for the great post and I am more motivated to keep going by not drinking alcohol ever. I’m such a yoyo dieter. I usually go sober all spring, lose 20 lbs, and hit the gym hard. When summer rolls around, it’s tough to avoid a cold beer. Then falls hits… oktoberfest, thanksgiving, xmas, and new years keep the brew flowing. By late winter, I’m sick of beer again…back to 1800 calories a day and 2hr gym sessions. Wish I could just moderate all year. Alcohol is inflammatory and likely part of your weight loss was due to a reduction in inflammation. I quit in 1990. In my life it interfered with efficiency and gave me headaches and crappy sleep so I decided the social grease wasn’t worth the cost on my desired lifestyle. Never missed it or even really thought about it after the first year. I still have 30 year old bottles of bourbon in the closet in case someone stops by, or I need to clean my glasses. Great post! It was great meeting you at Fincon! My husband and I are very casual drinkers meaning maybe 1 or 2 a week. We rarely get drinks at bars or restaurants since they cost a lot in the DC area usually $12+. We tend to go out hang out sober and have a less expensive drink or beer at home. You made a good point about the health effects. I’m now 39. I have noticed probably due to health issues like I have reflux (Barrett’s esophagus) and I had my gallbladder removed over a year ago that I get even more deyhdrated then years ago. I sleep so much better. Sleep to me is so important for good health. Listening to your body is key. Cheers! Wow, 8 lbs in one month. That’s impressive. I love beer, but I rarely drink now. I don’t miss it much. Occasional drinking is perfectly fine for me. Intermittent fasting worked really well for me. I lost 10 lbs in 2 months. The weight stabilized now and I’m pretty happy with it. Great stuff. Not much of a drinker here, but I have also found that shaking things up by limiting food times, removing sweetners, not eating out, changing cuisine, etc can be very educational. I am guessing that your weight loss was not just about the calorie reduction, but also about the fact that the calories removed were of relatively low nutritional quality, moving your overall balance towards the better. Nice post. I’m in the same camp- I brew and drink a lot of beer. Starting at the beginning of November, I eliminated weekday beer drinking, which is normally 1 or 2 around dinner time. I’ve slept better, and I’ve dropped 5 lbs in less than a month with no other lifestyle adjustments. Rather than intermittent dieting or abstinence, I’m going to try to maintain a 3-4 day a week “no beer” guideline. We’ll see how it goes!